Our WeBuzz.IM main server met an outage in the last server hours. We were sorry that we only learned that after it had lasted for several hours and it had caused lots of inconveniences to our users. We met a server outage about 2 years ago. And after that accident, we had already developed a monitor system to make sure all our services are running well all the time. But as too many factors may cause server outage, we could not take all possible outage reasons into our monitor system. From today’s lesson, we will take more factors into our monitor system. Thanks for your supports of our web messenger services. We will keep developing our monitor system and our web messenger services. BTW: If you find that our services are not running correctly, please drop us a bug report, so we will fix it or get it improved. It seems that September has lots of holidays. Just two days ago, it was Brazil’s Independence Day. And now, today and tomorrow are holidays for our Indian users. Today is Id-Ul-Fitr, and Ramadan ends. And tomorrow will be Ganesh Chaturathi. Even if you are not in India right now, tomorrow still will be Saturday. Ya weekend is coming. Happy weekend! Happy holidays! Happy September! Happy fall days! Happy September 7th! Happy Brazil Independence Day! Enjoy your holiday, our Brazil friends. BTW: We learned it from a traffic drop in September 7th. BTW 2: It seems that we had missed India’s Independence Day on August 15th, which is Sunday in 2010. We didn’t notice the traffic drop at that day. We are very proud to announce that WeBuzz.IM is providing web messenger for both online and offline. download the zip file, and extract it to your local computer, and then open index.html file in your browser. 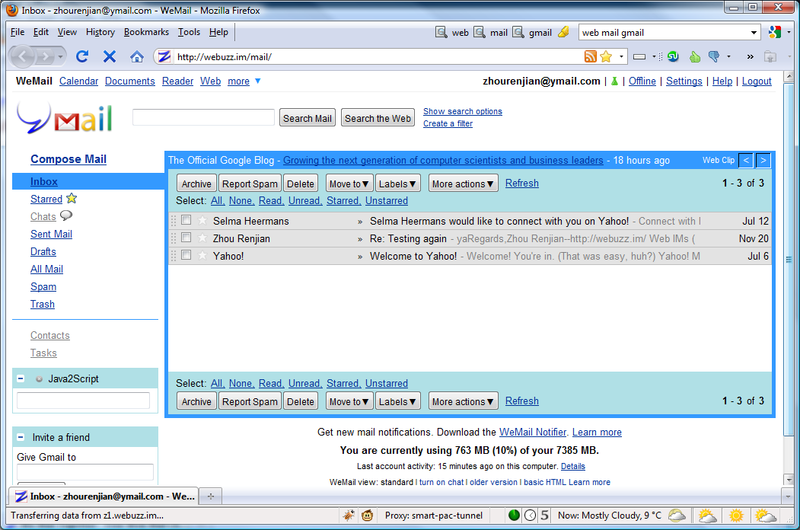 If index.html page is opened in the browser, everything is the same as WeBuzz.IM online web messenger. You can login into Gtalk/MSN/Yahoo! Messenger and other networks, and chat with your friends. To use WeBuzz.IM online web messenger, you only need to visit http://webuzz.im/ and other URLs. You will be updated automatically. 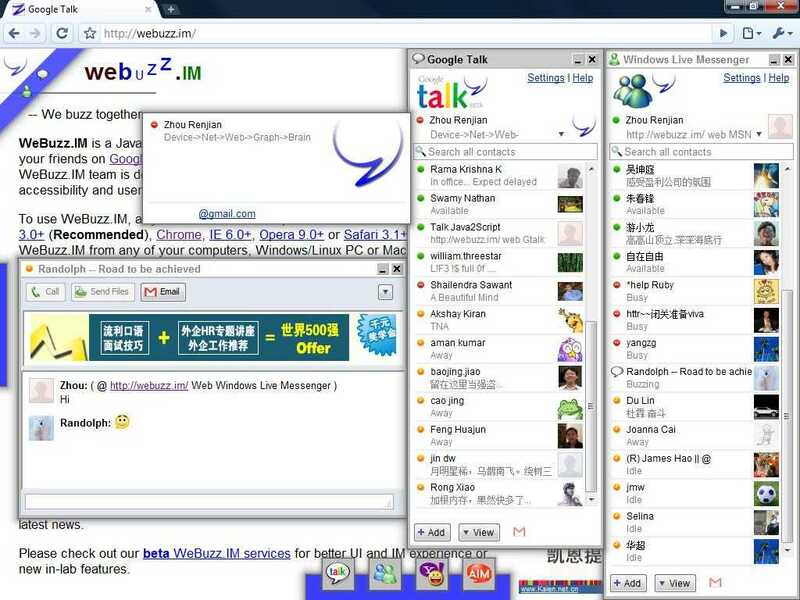 Lots of our WeBuzz.IM online web messenger service users can not access to Gtalk/MSN/Yahoo! Messenger and others services, because their networks block them. There are chances that their networks will block WeBuzz.IM’s websites. So we are introducing WeBuzz.IM offline web messenger to continue providing services to those users who can not access to http://webuzz.im/. If offline web messenger is downloaded to your local computer, your network can not block you from launching the web messenger. The offline web messenger contains a list of WeBuzz.IM service servers, it will keep searching the available server for your networks and connect for you. So almost all the time, you can chat happily with your friends. One fallback of offline web messenger is that you need to keep the messenger updated by downloading the updated version if there is one, all by yourself. But it should not be a big problem. we are not updating frequently. We may update offline web messenger monthly or so. Disadvantage: You need to download the updated web messenger. Please take a try on our WeBuzz.IM offline web messenger, we think you will like it. And please give us comments about how you feel about it. Translations are originally provided by Google Translate. Current translations are not perfect. Your helps are needed. If you find some translations incorrect, you can click on “help translate” to open the translation editor and provide your own translations. We will merge your translations later to give our users a better service. Thanks for using WeBuzz.IM ( http://webuzz.im/ ) web IM services (web Gtalk/Google Talk, web MSN/Windows Live Messenger, web Yahoo! Chat/Messenger, web Facebook Chat, web AIM/ICQ, web XMPP/Jabber) to keep contact with your friends. Here is our service updates v201005 newsletter. Clicking on the new bookmark item will load WeBuzz web IM on any page of any website. to add a link for user to load WeBuzz.IM. The above “webuzz.im” domain can be replaced with domain “java2script.com”, “java2script.net”, “java2script.org”, “demo.java2script.org”, “izuz.net”, “uziz.net” and “kexmail.com”. Other languages are not listed here. Visitors can select their own languages in the page’s language box. We buzz together @ WeBuzz.IM . Help Needed: Can You Access These Files? We are dedicating to provide better accessibility for web IM services.Even though we have a list of servers, we still receive lots of reports saying that our servers are blocked in their networks. Here we could like to ask you a question in order to provide you a better solution. Can you access these files? or (Internet Explorer) showing a download dialog ( you can cancel it ). If it is blocked already, it will show noting or show a page saying connection reset or other error messages. Please leave a comment, telling that all are accessible or which one is blocked. Thanks! The better web IM solution is coming, please keep tuned! BTW: Update v20100412 has been rolled out already. – – We buzz together @ WeBuzz.IM . We are very pleased to announce WeBuzz.IM update v20100406. After busy work of holiday and weekend, we fixed some known stability problems and pushed out update v20100406. So, WeBuzz.IM is considered much stabler. Please let us know your feedback or your problems. We are always dedicating to build web IM services with better security, accessibility and user experience.